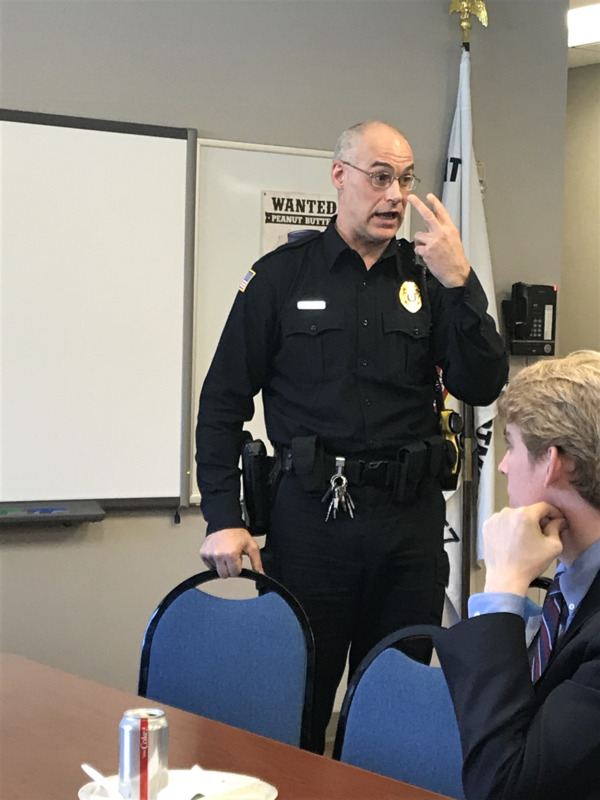 Thiensville's new Police Chief, Kurtis Kleppin spoke the the Thiensville-Mequon Rotary Club at Tuesday's final meeting at Village Hall. Chief Kleppin certainly took the opportunity to identify the trouble makers in the group... Jim Lysaught! It was a fun opportunity for Rotarians to get to know a new member of our community and hear about his background and some of his stories. He indicated that he wanted to be a chief, and due to the shortage of officers, he was able to be selective in the communities in which he applied. When Thiensville's position came up, he thought it would be a perfect fit for him, and was pleased to find he would be a perfect fit for us. Chief Kleppin told his stories about his encounters with State Patrol, and the tickets he has received since becoming a police officer. Needless to say, if you think knowing the guy will get you out of a ticket in Thiensville, you might want to think again. You're better bet is to slow down and not break the law. Thanks for taking the time to speak to the club, Chief, and we look forward to your future here.